In January 2011, the POWER (Providing Opportunities with Enhanced Resources) Center staff moved into their new office in Minot State University’s Student Center as part of a Title IV grant. That grant was recently renewed, and the center received an additional grant that focuses on the needs of students with disabilities. The U.S. Department of Education grants, totaling $440,000 per year through 2020, provide opportunities for academic development, assist students with basic college requirements and motivate students toward completing their postsecondary education. “The POWER Center offers support to students who possess rising potential but need support, motivation and confidence to succeed with their university education,” said Holly Major, POWER Center director. To be eligible to participate in the POWER Center, an individual must be currently enrolled or accepted for full-time enrollment at Minot State in pursuit of a bachelor’s degree, be a U.S. citizen or permanent resident and meet at least one of three qualifications. The qualifications are being a first-generation university student, being income eligible (family taxable income is at or below federally determined guidelines) or having a documented disability. Academic tutoring, directly or through other services provided by the institution, which may include instruction in reading, writing, study skills, mathematics, science and other subjects, to enable students to complete postsecondary courses. Advice and assistance in postsecondary course selection and priority registration. Information on financial aid programs, benefits and resources for locating public and private scholarships, and help in completing financial aid applications. Education or counseling services to improve the financial literacy and economic literacy of students, including financial planning for postsecondary education. Activities designed to assist students in achieving career and academic success. 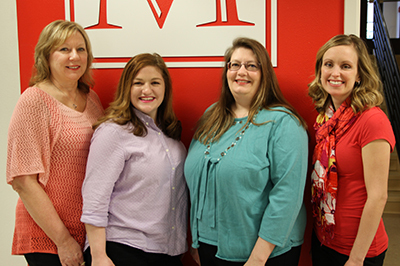 POWER Center staff members, pictured left to right, are Keryl Lesmann, program assistant, Connie Blair, tutoring and mentoring coordinator, Major and Tiffany Fylling, advising coordinator. The POWER Center, as a TRiO-Student Support Services program, strives to increase the retention and graduation of its participants and help students move from one level of higher education to the next. To apply for the POWER Center program, visit http://www.minotstateu.edu/power/ or contact Major at 858-4402 or holly.major@minotstateu.edu. Aug. 19 in the Conference Center, Minot State University convocation launches a new academic year. If student assistance is not available for coverage during the general session, President Steven Shirley asks employees to close their offices and attend. Breakfast items will be served beginning at 8 a.m.
At 8:30 a.m., Lenore Koczon, vice president for academic affairs, will provide welcoming comments. After comments from the presidents of Faculty Senate and Student Government Association and the Staff Senate vice president, Wes Matthews, human resources director, will introduce new staff members, and Koczon will introduce new faculty members. At 9:15 a.m., ShaunAnne Tangney and Linda Cresap will give a Higher Learning Commission update. At 9:30 a.m., President Shirley will address the campus community. Faculty are asked to remain in the Conference Center to vote on items passed by Faculty Senate last spring. Meetings of the three colleges will follow in the afternoon, starting at 1 p.m. Arts and sciences will meet in Aleshire Theater; business will meet in Main 316; education and health sciences will meet in Memorial 114. The MSU Fall Kickoff Celebration, coordinated by Staff Senate, is Aug. 19, the evening after convocation. Join your counterparts from 5 to 7:30 p.m. at the Scandinavian Heritage Park for food, entertainment, information booths, children’s games and fun. Food service will be from 5 to 6:30 p.m. The event is free to Minot State University faculty, staff and student workers and their immediate families. For questions about the MSU Fall Kickoff Celebration, contact Forrest Macy, Staff Senate president, at forrest.macy@minotstateu.edu or 858-3176. A complete schedule grid was sent to all employees via campus mail. Employees are encouraged to attend as many sessions as possible. The POWER Center is offering POWER Week, a precollege enhancement course, Aug. 17-21 to prepare new MSU students for their university experiences. Approximately 25 POWER-eligible students will move into their residence halls and spend four nights and five days on the Minot State University campus immediately prior to the start of fall semester. Through this opportunity, participants will learn about all the resources MSU and Minot offer. They will also connect with peers and become equipped with the tools and essential university knowledge that will lead to personal and academic success during their higher education endeavors. Presentations will discuss academic planning, study strategies and include financial literacy exercises and mock lectures. POWER Week students will have all expenses covered. They will also receive a backpack full of school supplies to help make their first semester successful, sponsored in part by the Bank of North Dakota’s College Planning Center. The POWER Center, funded by a TRiO-SSS grant from the U.S. Department of Education, serves 310 MSU students who are first-generation college students, students with disabilities or students who fall within income guidelines. To learn more about the POWER Center, visit http://www.minotstateu.edu/power/. 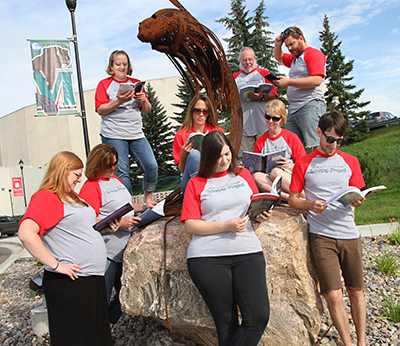 The Northern Plains Writing Project Institutes at Minot State University started July 6 and ended July 31. In addition to numerous writing and teaching exercises, the nine participating teachers also read and discussed Kelly Gallagher’s “Write Like This,” which involved getting students engaged in authentic writing, and his book “Readicide,” which presented ways to improve students’ literacy levels by getting them to love reading. Fischer has facilitated the Summer Institute since 2006 and became NPWP director in 2009. The North Dakota Council of Teachers of English honored him this year with an Award for Service. “The biggest reward is seeing how teachers blossom into writers themselves and witnessing how eager they are to bring writing activities to their students," Fischer said. For further information, contact Fischer at 858-3174 or ron.fischer@minotstateu.edu. 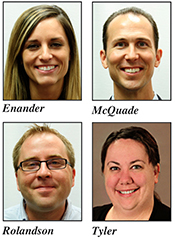 Minot State University welcomes new employees, Jessi Phillips Enander, Mark McQuade, David Rolandson and Katherine “Katie” Tyler. Enander, facilities administrative services clerk, studied psychology at Idaho State University, Pocatello, and is currently working toward a bachelor’s degree in addiction studies from MSU. She and her husband, Brandon, were married July 4. He has two boys, and she has two girls, so the blended family enjoys camping, skiing and family time. McQuade, music associate professor and Western Plains Opera general director, previously taught at Oklahoma Baptist University, Shawnee. He received a bachelor’s degree in vocal performance from Oberlin College Conservatory of Music, a master’s degree in vocal performance from the University of Oklahoma, Norman, and a doctorate in vocal pedagogy and performance from the University of Mississippi, Oxford. He is active in the National Association of Teachers of Singing and the National Opera Association. McQuade and his wife, Jennifer, have two sons and a daughter. He enjoys traveling, fishing and scuba diving. Rolandson, music assistant professor and band director, was a graduate teaching assistant at the University of Minnesota, Twin Cities, before coming to MSU. He completed a bachelor’s degree in music education from the U of M, Duluth, a master’s degree in music from Central Washington University, Ellensburg, and a doctorate in music education from U of M, Twin Cities. Tyler, enrollment services director, was the 4-H youth development state specialist for the Center of 4-H Youth Development at North Dakota State University, based at Minot’s North Central Research Extension Center. She earned a bachelor’s degree in biology and a master’s degree in educational leadership from the University of North Dakota. Aug. 19 — President’s Convocation. Aug. 19 — MSU Fall Kickoff. Aug. 22 — Move-In Day. Sept. 19 — Homecoming parade and football game. Additional details will be forthcoming. Amy Armstrong and Hilory Liccini, project directors at the North Dakota Center for Persons with Disabilities, successfully completed the 2015 University Centers for Excellence in Developmental Disabilities Leadership Institute in Newark, Del. This institute assists in the process of developing a diverse and committed cohort of emerging leaders within the UCEDD network. Chuck Barney, director of the Severson Entrepreneurship Academy, and Cari Olson, director of institutional research, completed all four phases of the “Blackboard Crash Course: Blackboard Basics and Creating Content; Assessment and Grading; Grade Book, and Minimum Engagement Standards and Best Practices.” Sherie Saltveit and Mark Timbrook, Office of Instructional Technology, completed familiarization training with Ultra and various other related technologies at Blackboard World 2015 in Washington, D.C., July 20-24. Evan Borisinkoff, assistant professor of special education, was recently appointed as NDCPD research core coordinator. Borisinkoff has expertise and research interests in the areas of literacy, inclusive best practices, evidence-based strategies, autism spectrum disorders, intellectual disabilities, positive behavior supports and using assistive technology including augmentative and alternative communication to support instruction and remove barriers. He has volunteered for social and community programs that support children and adults with disabilities such as Special Olympics and Easter Seals. He has professional affiliation with the American Association on Intellectual and Developmental Disabilities and the Council for Exceptional Children. Dan Conn, and Rosalyn Billy-Mohamed, assistant professor of teacher education, and three MSU students, Camilla Keller, Cheryl Mortezaee and Malia Salyards, will present research Oct. 8-10 at the American Association for Teaching and Curriculum Annual Conference at Portland, Maine. Conn and Billy-Mohamed will discuss “Empowering Women in the Classroom: The Subtle Power of Intentions,” while Conn and Keller will present “Aesthetic Memories: Using Perceptual Experiences to Elicit Prior Knowledge.” Conn and Mortezaee will present “Breaking the Mold: Rethinking Labels through Lesson Sketches,” and Conn and Salyards will deliver “Reading Well: Exploring Aesthetic Approaches in Literacy.” Conn is also nominated for the conference’s Dissertation of the Year award.